The growing interest in graphs shows no signs of slowing as organizations seek to realise the value buried in their connected data. In the last 12 months alone, Microsoft Graph Engine, and Google & IBM-backed Janus Graph joined existing players like Oracle, DataStax Enterprise, Titan and Neo4j, in the enterprise graph database market. But there’s another genre of datastore that’s optimised for connected data: the multi-model database. This blog post focuses on ArangoDB – a native multi-model database that combines the strengths of graph, document and key-value stores – and how it can power your KeyLines application. What is a multi-model database? Highly connected data —> graph database, etc. This approach, known as polyglot persistence, ensures good performance but presents challenges. Deploying to multiple database technologies in a single project is complex and has a greater maintenance overhead. One way to avoid these problems is to use a multi-model databases like ArangoDB. ArangoDB combines the advantages of a document, key-value and graph database with good performance and scalability. 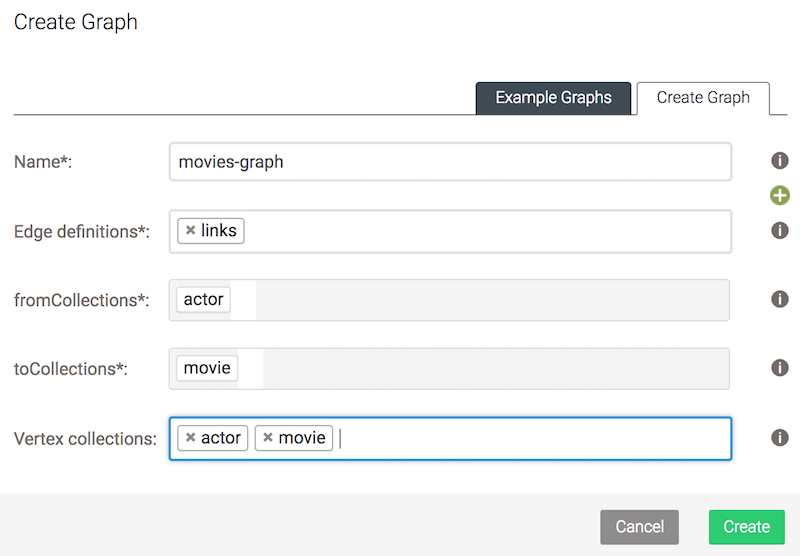 ArangoDB can work with KeyLines to power a robust graph visualization application. Let’s see how. Download and install the latest ArangoDB version. There are full instructions in their excellent getting started guide. You can run commands in the shell interface called ‘arangosh’. It’s best to create a user or change the root password before you continue. See ArangoDB’s instructions on managing users. Go to http://localhost:8529 to see ArangoDB’s neat web interface. 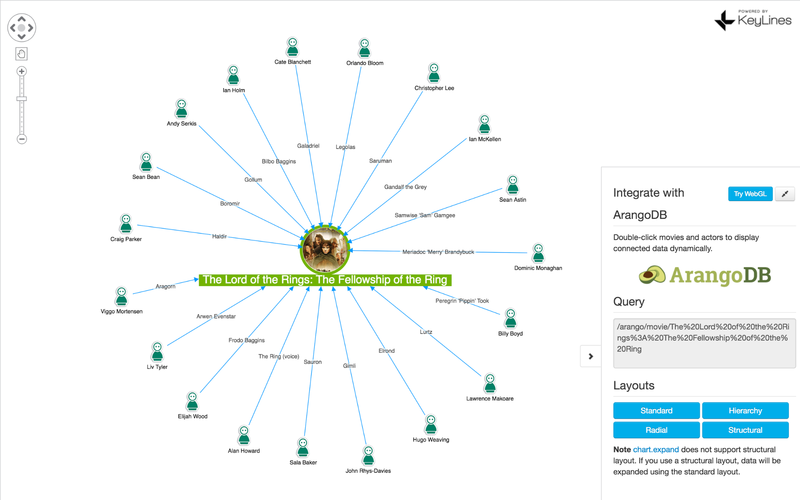 In this example, we’ll build a network of movies and actors to explore in a KeyLines application. We’ve defined the graph with a single edge collection and 2 collections for vertices. (Note: vertex is a graph database term for node, and an edge is a link). Now we’ve set up our collections and graph, we can import the data. You may see some WARNING messages in the console about ‘unique constraint violated’. These may look scary, but are completely safe to ignore. Due to the way we created the json files, this is just Arango’s way of telling us that it will not create a vertex more than once and that behaviour is completely reasonable for us. Don’t forget to add the options ––server.password [password] or ––server.username [username] if you have different credentials. See ArangoDB’s documentation on importing data. The ArangoDB website has some great AQL resources to help you return custom results. This sets up a router for any request that hits our endpoint and responds with ‘Hello World!’. If we load this Foxx service onto our database (more on how to do this later), then we can go to a URL similar to http://localhost:8529/_db/my_foxx_service/ to see a browser-based response. Let’s build a more useful Foxx microservice. 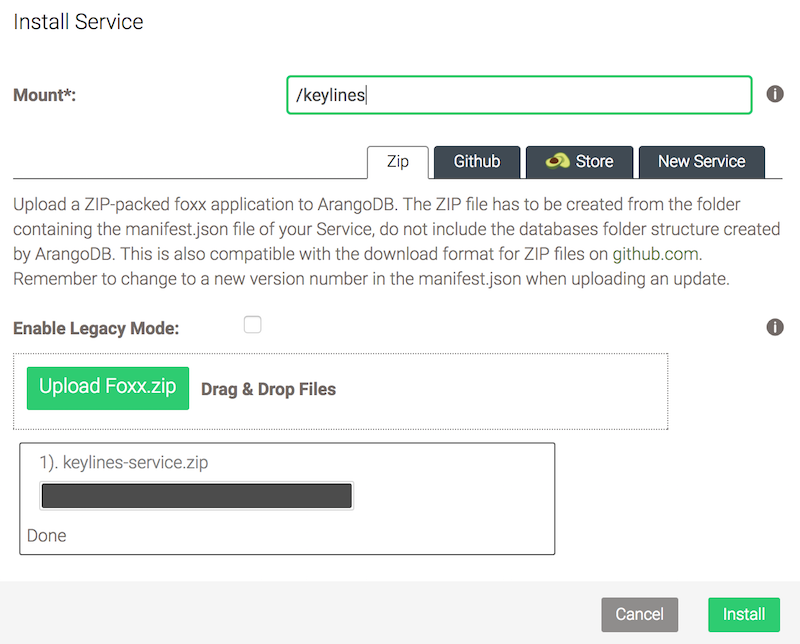 Create a new folder called ‘keylines-service’, for our Foxx microservice code. Go to the web interface and click ‘Services’, then ‘Add Service’. Choose an appropriate mount-point (the URL from which we can access the service – we called it ‘/keylines’ in this example) and upload the zip file. Finally, go to http://localhost:8529/_db/movies/keylines/Keanu%20Reeves to see the JSON result of our service. If you’re inspired to try visualizing your own ArangoDB instance, or hook your KeyLines application up to the Arango database, why not get started now?